For uncomplicated mallet finger treatment involves splinting of the DIP (distal interphalangeal) joint in slight hyperextension for a period of upto 8 weeks, with regular monitoring. 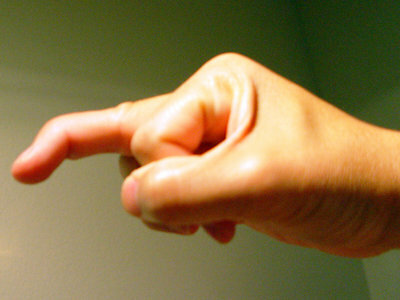 For complicated mallet finger injuries operative treatment has also been recommended. Mallet finger is a flexion deformity resulting from avulsion of the extensor mechanism from the DIP joint. Synonyms for this injury are baseball finger and drop finger, and jamming injuries in ball sports are common. The anatomy of the dorsal apparatus of the fingers is complex and has generated detailed descriptions. Its delicate balance allows the integration of intrinsic and extrinsic muscle function to coordinate fine digital motion. Disruption of the terminal extensor tendon’s attachment into the dorsal base of the distal phalanx is common in sports. Axial load and forced flexion of the DIP joint can stretch the terminal tendon, avulse the tendon attachment, or cause an avulsion of a variable amount of bone from the dorsal ridge of the distal phalanx. It commonly results from a ball striking the extended fingertip, forcing the DIP joint into flexion while the extensor mechanism is actively contracting. This produces disruption or stretching of the extensor mechanism over the DIP joint. This is seen in baseball catchers, fielders, football receivers, cricketers and basketball players. The physical examination demonstrates the drooped posture of the DIP joint with an inability to completely extend the joint. Swelling and tenderness are variable. If left untreated, a chronic mallet finger type deformity develops. This flexion deformity is caused by the unopposed action of the flexor digitorum profundus tendon. Radiographs are obtained to define any bony injury, especially an avulsion fracture associated with subluxation of the joint. The avulsion fracture is considered significant if greater than 1/3 rd of the joint surface is involved, in which case open reduction and internal fixation is required. Any subluxation requires open reduction and internal fixation. A fracture dislocation of the epiphyseal plate may occur in children. This injury requires open or closed reduction. Splinting is the treatment of choice for almost all mallet finger injuries. Open treatment can result in frequent complications, and the surgeon should resist the temptation to “make good better” by operating on these injuries. This is one of the few clinical entities in which the overwhelming evidence favors nonoperative treatment, even if slight subluxation of the DIP joint is seen on the initial lateral radiograph. For uncomplicated mallet finger treatment involves splinting of the DIP (distal interphalangeal) joint in slight hyperextension for a period of upto 8 weeks, with regular monitoring. For complicated mallet finger injuries operative treatment has also been recommended. The splint is then worn for an additional 6-8 weeks while engaging in sports activities and at night. Treatment is re instituted at any sign of recurrence of a lag. The splint may be made of metal or plastic and applied to either volar or dorsal surface; patients with dorsal splints maintain pulp sensation. The finger should be kept dry and examined regularly for skin slough and maceration. During mallet finger treatment, emphasize to the patient that the joint must be kept in hyperextension at all times during the 8 weeks, even when the splint is removed for cleaning. If a patient is not prepared to do so, then the joint should not be splinted. The consequences of not splinting are a chronic mallet finger type flexion deformity with osteophyte formation and degeneration of the DIP surface. A Maitra and B Dorani. 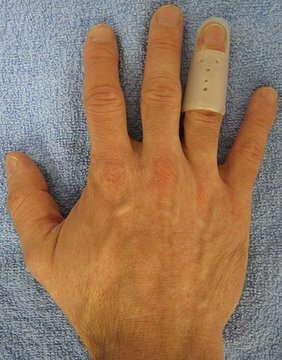 The conservative treatment of mallet finger with a simple splint: a case report. Arch Emerg Med. Sep 1993; 10(3): 244–248. Brzezienski MA, Schneider LH. Extensor tendon injuries at the distal interphalangeal joint. Hand Clin. 1995 Aug;11(3):373–386. Groth GN, Wilder DM, Young VL. The impact of compliance on the rehabilitation of patients with mallet finger injuries. J Hand Ther. 1994 Jan-Mar;7(1):21–24.